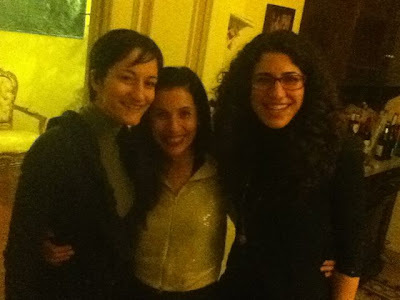 The times I am most relaxed and happy out and about in Lucca (when I am not with family) is when I am with Giusy and Serena. This time we got to hang out with Giusy's boyfriend/pilot/ soul mate -- Franco. He was very sweet and exhausted and even more exhausted after trying to keep up with our dinner conversation. Giusy and Serena are always in sync with each other and do things like bring their christmas presents early because we probably won't all be together until after the holidays since Giusy lives in Florence and travels a lot. They couldn't call me to remind me because they are too polite to say we are going to have the presents ready, so I am always the like sloppy, second cousin who never figures out how to grab the check first or how to help clean up without making the other person have to say that you shouldn't or know when it is the perfectly right time to wear white pants or when you don't have to wear heels, but they always know and I never do and they seem to love me anyway.